The 2005 exhibition was a double celebration - not only was it our 50th Annual Exhibition, but also the club's 75th anniversary, so we wanted to make sure it was a good one! St. Edwards School, London Road, Romford. St. Edwards School was a new venue for us in 2005, much closer to our club headquarters than our previous exhibitions have been, and following success of this exhibition we hope it will become our permanent home for the exhibition for many years to come. 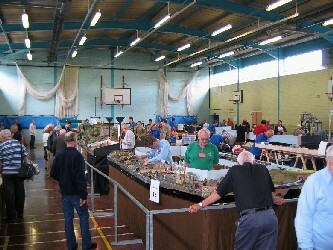 We were able to spread out in two separate halls, allowing us to exhibit a broad selection of layouts, plus a full compliment of trade and demonstration stands. A fictitious railroad running from Fort Morgan to Colorado Springs in the State of Colorado. 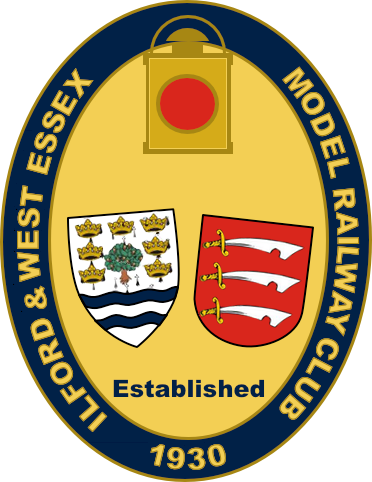 Modelled on a typical rural end-of-line terminus, anywhere between 1928 and 1968. 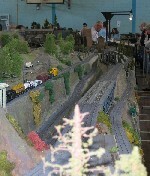 This layout depicts primarily an industrial and colliery scene with some local passenger services, set in the 1960's to allow a mixture of steam and diesel. 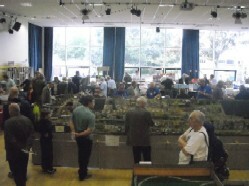 This layout is set in South London suburbia during the early 1990's Network South East period, with third rail electric operaton. Set in the foothills of the Rockies somewhere Colorado the nominal time period of the late 60's. The Kelbrooke branch of the Midland Railway, a single line branch connecting with the Midland Railway's Skipton to Colne trains though workings to Lancaster. Era - June 1914 - just two months before the war. This is a fictitious station somewhere on the underground. The location and period are both flexible to allow a variety of rolling stock. Terminus of the West Somerset Railway, this layout is operated to a timetable on a Saturday in the summer of 1947. This layout depicts an old sandstone quarry line upgraded to passenger use, circa 1900. A canal side wharf site taken over by Midland Railway and developed to serve a growing urban area. A small layout built on half a door (hence the name 'roodaflah'), depicting a narrow gauge railway running from a mainline to docks. A layout designed to run (very) long freight and passenger trains in the American style. St Nicholas is an imaginary spa town on the edge of the Peak District, 1978 to 1980 era. Represents station at Tamworth on the Trent Valley line on the LNWR/LMS West Coast main line, circa 1930's. Represents a secondary mainline on the outskirts of London, served by both mainline and and London Transport services. Period is 1950's, though the odd excursion either side of this is not uncommon. The small town of Taw Magna is somewhere in the West Country, around the 1950's. These are listed in alphabetical order. No favouritism! Engine Shed Leytonstone retailer, stocking Peco, Bachmann, Lima, Farish, Hornby and many accessories, plus the complete range of Ian Kirk 4mm coach kits. 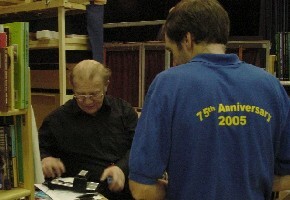 Also DCC control systems.